I am proud to have three pieces in this juried fiber art show. Worn Through » High Fiber, High Art. Non-profits struggle in the best of times. It is hardly news any more that they are struggling even more in the current economy, and that many of them are failing. But somehow the announcement that the San Francisco Museum of Craft and Folk Art will be permanently closing its doors on December 1 of this year was still a shock. Unlike the campaign to save the American Folk Art Museum in New York City last year, there were no editorials, no online efforts, and no real warning that the museum was in such danger. Its closure will leave the San Jose Quilts and Textile Museum as the sole folk art and craft museum in all of Northern California. The closure of the SF Craft and Folk Art Museum, and the near loss of the American Folk Art Museum last fall not only highlight how little attention and understanding these types of museums receive, but also how important it is for patrons to support their museums financially if they can. Deborah Corsini, Curator at the San Jose Quilt and Textile Museum (SJQTM), acknowledges that in the current economy competition among non-profits is especially fierce, since there is less money for everyone. This puts pressure on the institutions to become more creative in their fund raising. The SJQTM’s current show demonstrates that, occasionally, this pressure can actually result in incredible shows, and inspire incredible art. On October 20, SJQTM held the VIP reception for their annual fund raising event, High Fiber under 5: an exhibit of textile and fiber art donated to the museum to be sold for under $500, with most of the pieces ranging between $100 and $350. High Fiber has, for the past four years, been the museum’s main benefit art sale, featuring the textile work of both well-known and emerging fiber and textile artists. It benefits not only the museum, but the artists directly, with both parties sharing a percentage of the sale. The museum received over 300 entries (submitted by photograph), and selected 262 pieces for exhibit and sale. The museum’s Executive Director, Christine Jeffers tells me that they made $15,000 in the first weekend. Both she and Deborah were extremely pleased with this year’s show and turn out. More than 100 people attended the VIP benefit this year, an exponential increase on the 30 to 40 attendees of the year before. However, Christine tells me they are still growing an audience that not only appreciates, but collects textile art in the San Jose community. One of the ways they achieved this this year was to reach out to knitters, weavers, quilters, and other textile arts practitioners in the community who have always made objects, but never considered themselves as “artists”. Answering the museum’s call-out, many in the local arts and crafts community donated pieces, all sized 15″ x 15″, for a secondary exhibit, Fiber Shots to be sold for $100 each. This fits into Christine’s ongoing plan to make the museum more participatory. She believes that the community and their patrons will gain a deeper appreciation of textile and fiber arts if they have experience working in the medium themselves. One goal of this year’s High Fiber preparation was to include as much work as possible. The submissions were juried by Curator Deborah Corsini, textile artist and SJQTM board member,Yvonne Porcella, and Lynne Koolish, a quilt artist and dyer and the Vice President of the SJQTM board. Their selections have made this show the largest and most diverse in High Fiber’s — indeed, the museum’s — history. Deborah says this makes it possible for the show to display the wealth and variety of what contemporary fiber artists are doing, and it is excellent for a museum that continuously challenges people’s perceptions of the textile arts. 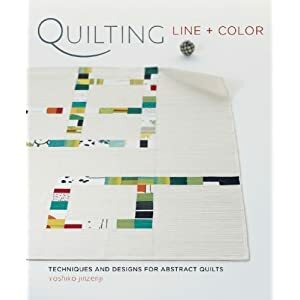 There are quilts, sculptures, tapestries, embellished or collaged pieces, weavings, mixed-media pieces, and knitted jewellery of both yarn and wire. Deborah described her position as the curator as “selecting and designing”, and while the richness of the show is extremely advantageous in a sale show, once the pieces had been selected, designing and installing a show of 262 pieces of different sizes and mediums was a challenge. Since it is a sales show, she was already having to consider it from a different perspective, showing each piece to its best advantage. Her biggest challenge was to arrange the work in a way that would keep people interested without overwhelming them as they viewed so many pieces. She told me that in previous shows she had tried to keep multiple pieces by a single artist grouped together, but that this year, in order to keep flow and balance, she often would separate the works, scattering them through out the gallery. This actually helped sales, since people might come across an artist again later which would make them revisit the previous work they had seen, giving it a second consideration. Deborah is also proud that not only are there many famous textile artists, such as Sheila O’Hara, Dominie Nash, and Ann Wilson, but new and emerging artists, some of whom had never worked with textiles as a medium before. Another new aspect for High Fiber this year is the online gallery, which not only showcases all of the work, but offers the opportunity to purchase (by phone) the pieces to anyone, even those who cannot make it to San Jose. The San Jose Quilt and Textile Museum is luckier than most in that it owns its own space. Their 35th Anniversary exhibit opens November 14th, Deborah and Christine would like the museum to stay open another thirty-five years, if not more. As a way to make the museum more participatory — and to grow the audience of those who not only appreciate but collect textile art — Christine has instigated a number of classes and lectures at the museum for patrons. On January 5, 2013, Shelly Zegart, who produced and hosted the PBS program “Why Quilts Matter: History, Art, and Politics”, will be presenting a program entitled “What Is Art?” to discuss the value of textile and fiber arts. In addition, classes on how to quilt and work with textiles are being planned. All of this augments existing programs that reach out to local schools, and to women’s shelters. Christine is a South Bay native and a long-time lover of the arts who feels strongly that textile arts should be considered contemporary art. This is a sentiment echoed by Deborah. She feels the museum offers both history and inspiration to the community, especially as interest in DIY and crafts is rising, seemingly in response to the digital age. People want to do things with their hands, she says, and the museum can open young and old alike to the rich past of the textile arts they are just discovering. But I keep thinking of San Francisco, and wondering what pressure this is going to place on SJQTM. These museums only exist through our support. Hopefully, through continued excellence in their exhibits, and more events such as High Fiber, museums can increase their patronage, and more importantly, membership and support. And perhaps through greater awareness of what is possible, people will take fiber arts and crafts out of the classification of country fairs and grandma’s attic, and put them in the contemporary art space where they belong.